The colleagues over at the Blog Herald sat down and gathered some interesting data about Twitter usage and demographics, putting these against Facebook statistics. The result is an amazing infographic with lots of interesting data. Here at The Blog Herald we wondered How did Twitter grow that much? and Where do those Tweets come from? The results are rather surprising and we learned that the top three tweeting cities in the US (Los Angeles, New York and San Francisco) averagely tweet less in one minute than when basketball fans and football/soccer fans go crazy and start updating the world in 140 characters maximum. 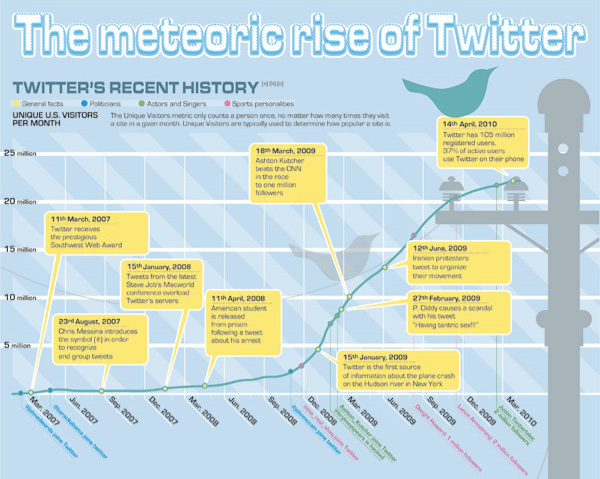 To see the complete infographic, you’ll have to head over to The Blog Herald: The Meteoric Rise of Twitter. Here’s a teaser already.